The grizzly bear (Ursus arctos horribilis) is a sub-species of the brown bear that originally came to North America from Eurasia on the Bering Straight land bridge 50,000 – 100,000 years ago. Brown bears once occupied much of Europe, Asia, the Middle East and North Africa. For many years, the grizzly bear and the brown bear were considered separate species, but as scientific knowledge improved, it became clear that the grizzly bear was simply a sub-species of the brown bear established by the collapse of the Bering Straight. 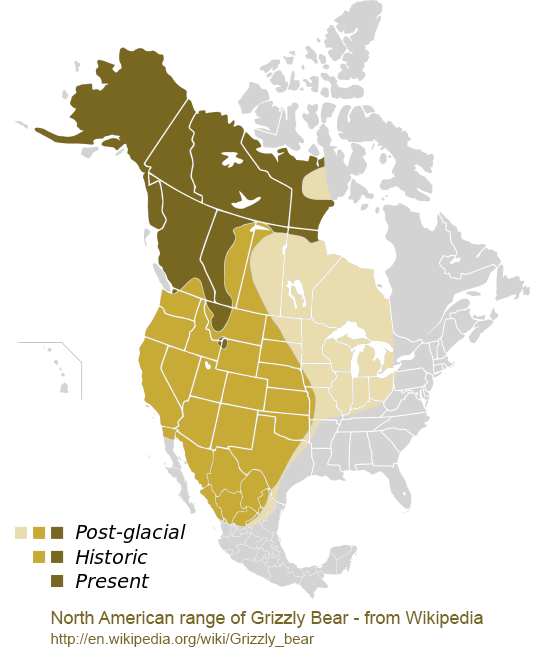 In North America, early pioneers were met by strong grizzly populations, particularly along the east coast. North American First Nations tribes reported to Lewis and Clark that they would kill grizzlies with hunting parties of in excess of a dozen people. At first Lewis and Clark were skeptical of the grizzly’s power against a rifle-equipped man, but they quickly learned the fierce power and aggression the bears possessed. The species obtained its Latin classification Ursus arctos horribilis “bear horrible” from naturalist George Ord in 1815. The English name “grizzly” refers to the “grizzled” fur with its gold and silver tips. Attitudes towards grizzly bears have shifted significantly within the last century. As rural dwellers began to migrate to cities, the “horrible bear” became less of a day-to-day reality. 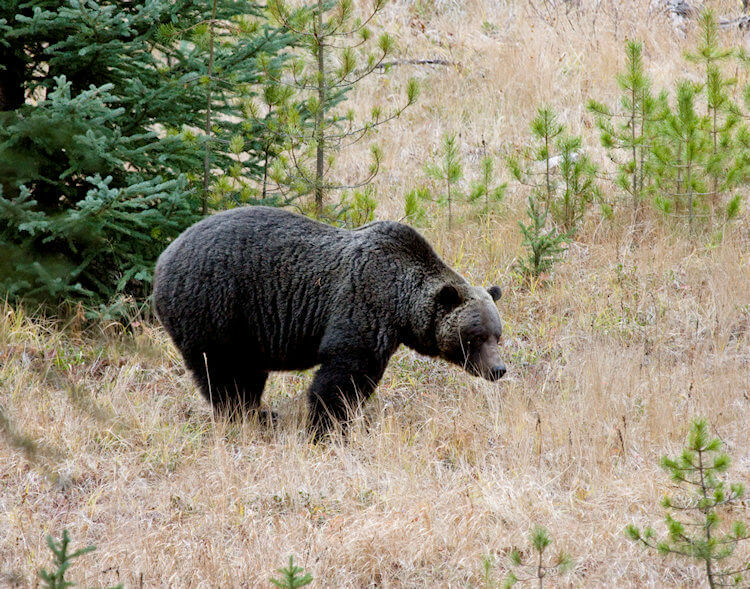 Once viewed as a disruption to property ownership and personal safety, the grizzly bear came to be seen as a distant and beautiful icon for the backcountry. In some jurisdictions, the effects of earlier attitudes were irreversible: grizzly bear populations had dropped to 600-800 in the USA and, as a result, they were listed under the US Endangered Species Act in 1975. Today an estimated 1,500 grizzly bears remain south of the border – they have been extirpated from 98% of their historical range in the US and likely will never recover given the degree of human development. Due in part to the expansive and remote nature of our province and in part to early conservation efforts, such a decline did not occur in British Columbia. Today, grizzly bears continue to occupy 89% of their historical territory, corresponding with areas of high human concentration, agriculture, and infrastructure development. Grizzly bears have brown fur with distinctive silver or gold tips. They can be easily distinguished from black bears which, despite their name, are not always black. A brown-phase black bear will have a straighter facial profile, while grizzlies have smaller heads and round, furry ears. The most notable difference between a brown-phase black bear and a grizzly bear is the grizzly’s large shoulder hump. Grizzly bears vary in weight depending on their location and the food available, but boars are typically around 400-790lbs while sows are generally 290-440lbs when they emerge from hibernation in the spring. By fall, they are up to 30-40% larger. Grizzlies are habitat generalists that can reside from sea level to high-elevation alpine environments. They are omnivores that enjoy a broad range of foods such as salmon, ungulates, small game animals such as beaver, marmots and ground squirrels, forbs, berries, whitebark pine nuts and skunk cabbage. Grizzly bears hibernate for 7 months of the year, digging dens with narrow and steep entrances that will be quickly covered by snowfall. They are picky about their dens, often building more than one until they are satisfied. Sows typically have their first litter when they are 6 years old. Mating season occurs in late May to early July. Eggs fertilized in the summer will not implant until the bear goes into hibernation in the fall. This delay helps ensure the sow has sufficient nutrients to handle the pregnancy. Cubs are born in the den in January or February during hibernation, and remain there until the spring. A litter is typically 1-4 cubs. Since grizzlies are not monogamous, litter mates will often have different fathers.